Even for my blog, this is a slightly odd thing to talk about. But it is an interesting little nugget of animation that, with Robin Williams’ recent passing, I have been thinking about. I wanted to write something as a bit of a tribute to Williams, and since I don’t think thoughts on Robots would be that, I’ve opted for this. I loved this opening. My brother and I would watch the film a lot when I was a child, and I would happily sing along to the snippets of ‘Large al Factotum’ that open the short. Though I knew that legendary Warner Bros. director Chuck Jones made the animation seen, only today did I find out a full five minutes of animation were made. True, the sequence ends when the Doubtfire script demands it, but this is still a very interesting little nugget. 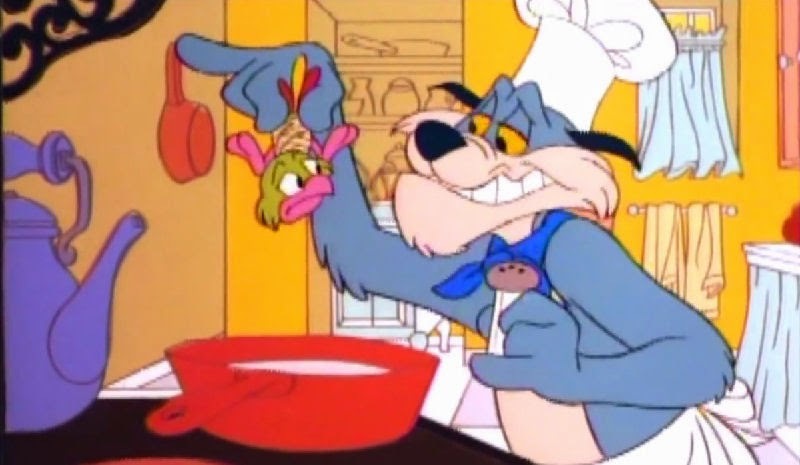 Clearly a parody of Sylvester & Tweetie, the short’s slapstick has more in common with Jones’ run on Tom & Jerry. It’s gleefully classic – the cat wants to eat the bird, so chases him, but ends up injuring himself or letting himself get distracted. But of course overlaid on this is the fun of Robin Williams taking on the roles of both cat and mouse. The cat’s smooth voice has something of the voice Jeremy Irons would later give Scar, especially saying ‘I think not’ – a line I’d like to believe was a reference to the sinister cat in Watership Down, unlikely as I know that to be. His Pudgy is irritating, but hey – is that not perfect given Mel Blanc’s delivery of Tweetie’s lines? He sure is. :) Even after his death. I can never get enough of his work outta my mind without thinking of the good times he made my childhood look awesome today. Even Robots of all films. (I know we'll never get a sequel due to his sudden passing.) But he has made history as both a voice actor and an actor of films as well.